U-Eight is a 90-home condominium building in the U-District, located within easy walking distance to UBC Okanagan in Kelowna, BC. Designed by Meiklejohn Architects Inc., the building’s architectural theme offers a distinctive ‘Campus Modern’ feel. 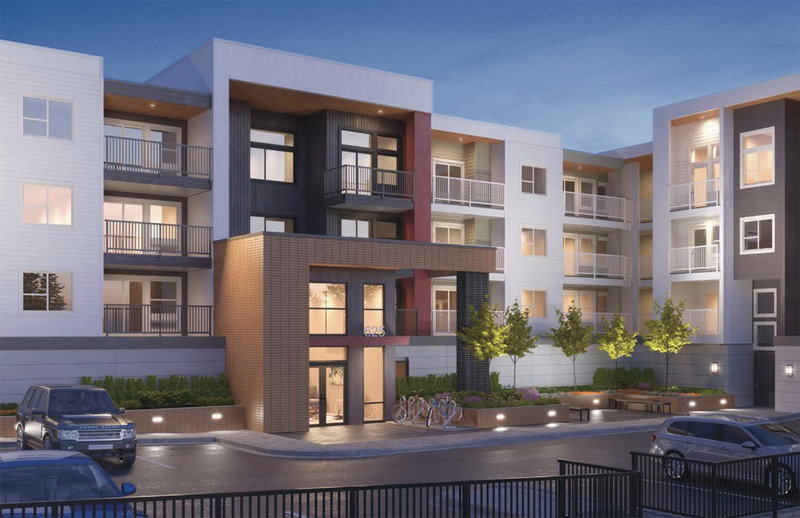 U-Eight offers a mix of studio, one, two, and three-bedroom condominium residences and is anticipated for completion August 2020, in time for the 2020/21 academic school year. 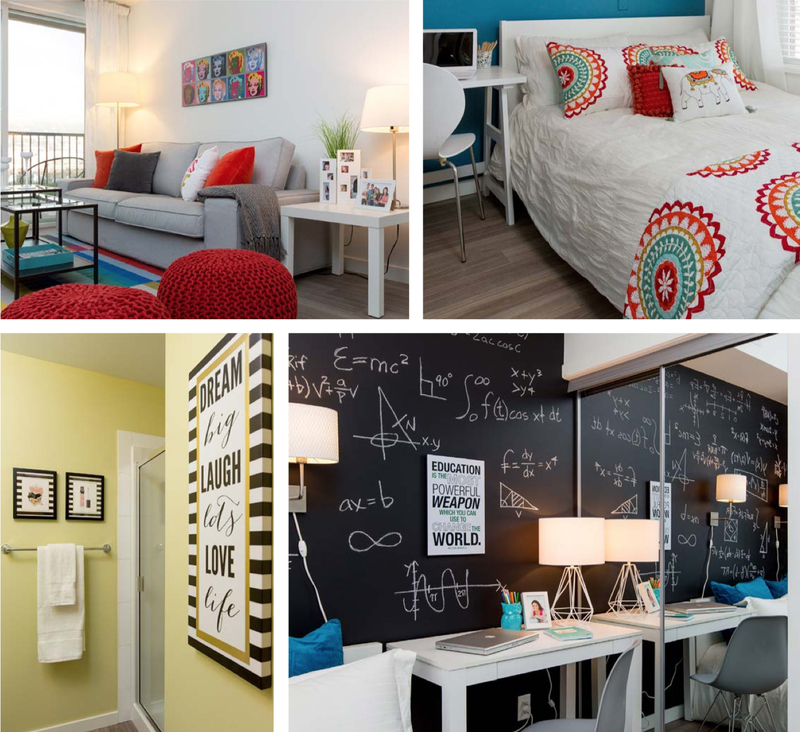 U-Eight is built with the student in mind and offers the ideal university living experience, without the limitations of traditional residence. As accommodation options for students are very limited, both on and off campus, demand for housing is extremely high at UBC Okanagan. There is only enough on-campus housing for 17% of the student population, and a spot in residence is only guaranteed for first-year students. Second and third-year students are entered into a lottery for a spot in residence with no guarantee they will be accepted. In 2017, over 900 students were placed on the waiting list for on-campus accommodation. In Fall 2018, Canada Mortgage and Housing Corporation (CMHC) announced that Kelowna’s vacancy rate was 1.9%, which makes finding off-campus accommodations to be just as difficult as on-campus. Adding to the rental demand is the growing trend of university grads choosing to remain in Kelowna after completing their education. Young people relocating to attend school tend to rent throughout their schooling and early working years placing further pressure on the rental market. UBC’s Okanagan campus is located on the outskirts of Kelowna, so students who live off-campus need to deal with the added cost and stress of public transit or parking. With only enough parking for 25% of the student population and at a cost of up to $500 per school year, parking is a major issue. and students can enjoy the best of on-campus amenities, including delicious food choices, gym, and popular student hubs. Also, for the first time ever, students can enjoy one-stop shopping at Airport Village, an approximately 40,000 square foot shopping and amenity centre, which boasts a Nesters Market grocery store, Pharmasave, Tim Hortons, Dairy Queen, DunnEnzies Pizza, Great Clips Hair Salon, Canada Post Office and more! In 2005, UBC Okanagan developed a Master Plan (The Campus Plan) to guide where and how future academic and research activities, student housing, campus services, and infrastructures will be configured over the next 20 years. Since then, $450 million has been invested at UBC Okanagan to grow and enhance the university. The growth has been so strong at the university that the Campus Plan’s growth projections were not only met, but 10 years earlier than expected. In September 2015, The Campus Plan was approved by the Board of Governors. The plan will more than double the university’s current academic space by adding an impressive 918,075 square feet. The plan has already begun to take shape in November 2016 with the approval of a $30-million-dollar library expansion. This expansion will create 45,000 square feet of study and learning space, adding approximately 400 more classroom seats for students. Owning a home at U-Eight is not only a great way to support your son or daughter’s success, but it also makes financial sense for your family. Paying for housing is inevitable while your son or daughter attends university, so why not put your monthly payments towards owning a home? Whether you decide to sell your home at U-Eight once your son or daughter graduates or continue to rent to new students, you can be confident in your investment. Parents of students living at U-Eight can rest easy knowing that their child is living in a fully secured, brightly lit building. Safety is paramount at U-Eight and students will feel safe with most of the parking in a secure underground parkade, and FOB access for secure entry into the building’s lobby. At Mission Group, we take an Inspired Green® approach with all of our communities. Our goal is to minimize our environmental footprint in five areas – energy, water, air quality, recycling, and climate change. U-Eight is situated in a well-connected community that encourages active transportation. 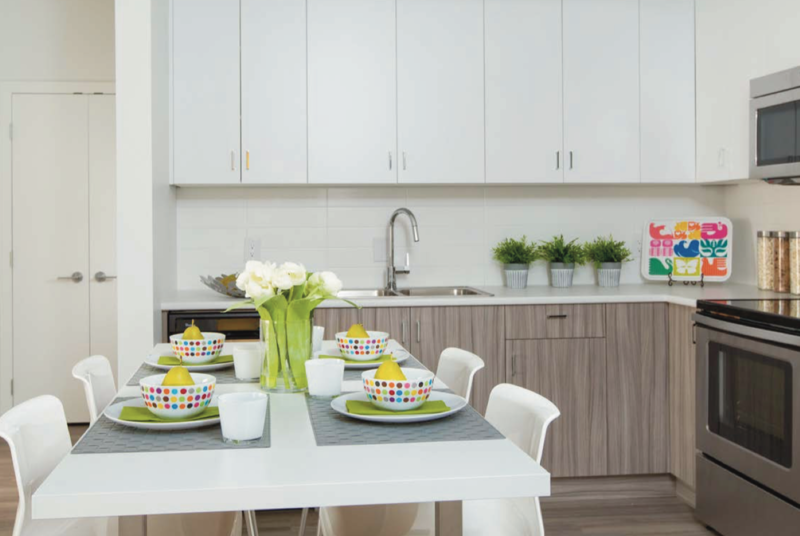 You can take a short walk to the campus and various amenities, or enjoy an easy transit ride to many destinations including Airport Village amenity centre and downtown Kelowna. U-Eight has been designed to reduce unnecessary water consumption. Homes feature water efficient plumbing fixtures and use irrigation systems and site specific landscaping that conserves water. 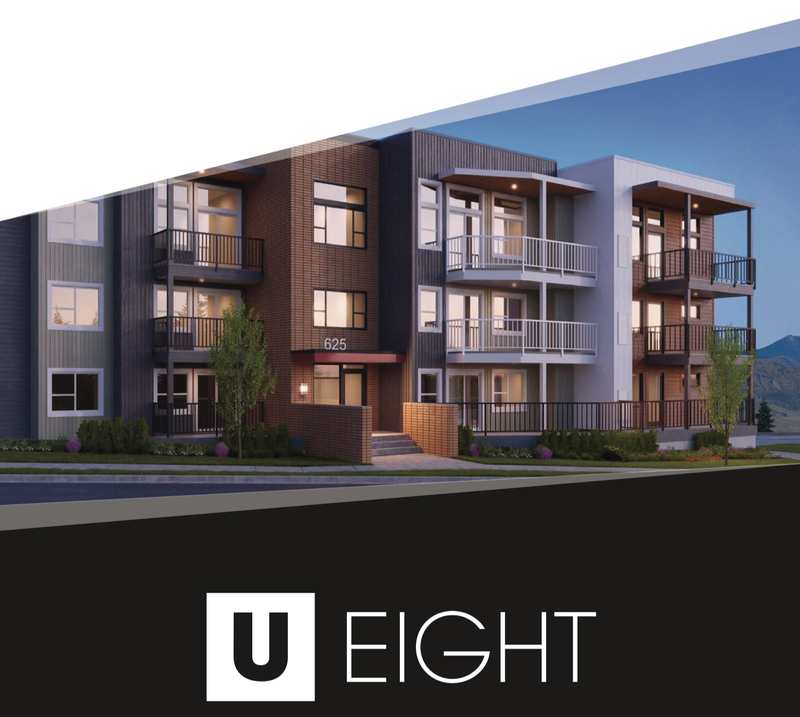 U-Eight maximizes energy efficiency by using environmentally responsible heating, ventilation, and air conditioning systems, as well as energy efficient appliances, low-E windows, and carefully-selected building materials. Homes have been designed to improve air quality by using low VOC finishes, and an automatic air exchange system that circulates fresh air throughout each home, resulting in a healthier living environment. Studio, 1 Bedroom, 2 Bedroom & 3 Bedroom homes available. Initial Deposit: $10,000 personal cheque, bank draft, or wire transfer upon writing the purchase and sale agreement. Additional Deposit: 10% (less the $10,000 initial deposit) within 7 days of writing the purchase agreement. Final Deposit: 5% within 30 days receipt of the Amended Disclosure Statement upon the Developer obtaining construction financing and building permit approval. Above rental rates are estimated averages as of Fall 2018 for comparable homes near UBC Okanagan. Rentals at U-Eight must be for a minimum of 30 days.